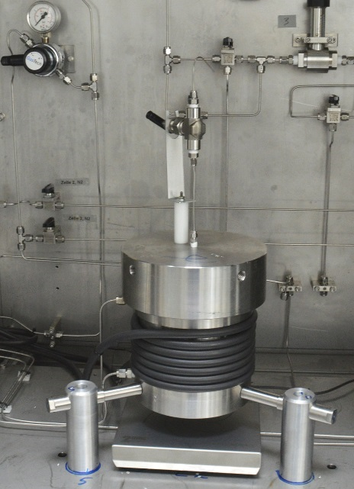 For the measurements of the permeabilities of the test-samples at reservoir conditions a triaxial cell equipped Quizix-pumps is at hand. This cell is designed for measurements of low permeabilities in the µD range. 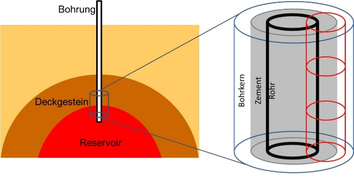 The permeability measurements are usually performed with nitrogen. 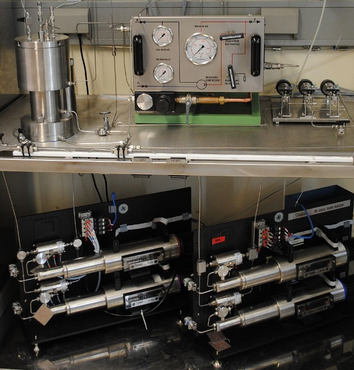 For samples with very low permeabilities helium can be used instead. 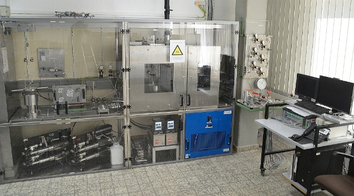 For experiments with hydrogen the laboratory was upgraded to fulfill the necessary safety standards and enhance the capacities. The autoclavs for long term batch experiments are explosion proofed. Experimental set-up with HPHT autoclavs in an explosion proofed cabinet. 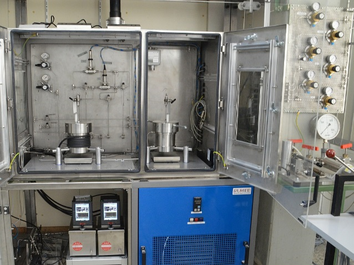 Measuring equipment for permeability testing (left side) and HPHT-batch experiments (right side). The composite samples represent the compound of the wellbore casing, cement and rock (reservoir or cap rock). In addition, pure cement samples are prepared and used for testing. 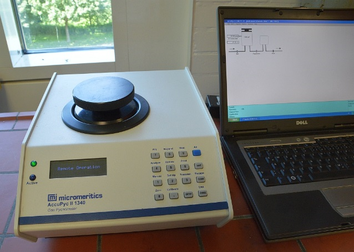 The characterisation includes measurements of porosity, permeability and density. The measurements are performed before and after the autoclave experiments to investigate the changes caused by the treatment in the autoclav. 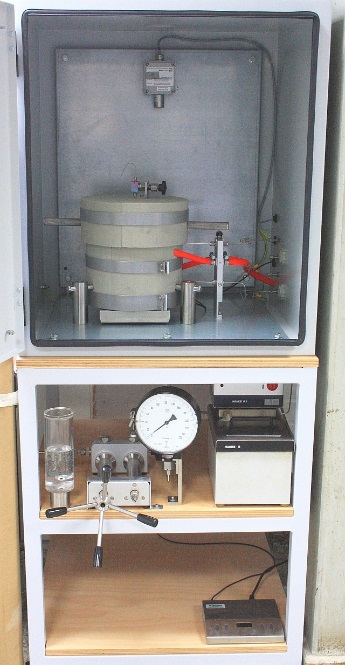 Gaspycnometer AccuPyc 1340 for the measurement of porosity and density under laboratory conditions. 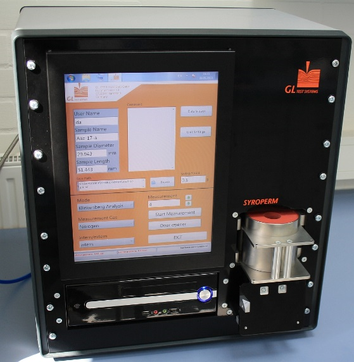 Gaspermeameter SYROPERM for the measurement of permeability and density under laboratory conditions. In autoclavs the test samples are exposed to hydrogen and synthetic formation fluid at reservoir temperature and pressure conditions. The experiments run up to six month. Changes in the tightness of the samples are analysed with permeability measurements and mineralogical-geochemical analysis in SP 1 and SP 5. Prototype of the HPHT autoclave.